It used to be that I considered ice skating the romantic equivalent or substitution of buying a dozen roses. Such is my wife’s love of the fairy tale sport. 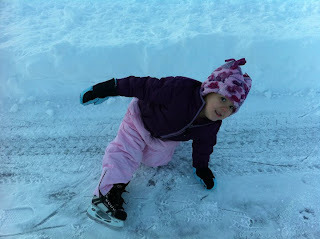 For my wife, the Winter Olympics are nothing until the pretty girls and boys take the ice. There is no substitute for the thrill of watching the skaters strive for a clean program. No feeling more crushing than watching a hard fall on a quad attempt. Anniversaries past were spent driving to Portland for an evening dining out and then a skate in new sweaters under the lights at whatever mall then held an ice rink. In my mind, I had scored the ultimate romantic points. In reality I stumbled clumsily on the ice along the walls of the rink as figure skaters practiced salchows in the middle. Had I been able to skate around the rink hand in hand with my wife, the false wind blowing through our hair, the classical music settling over the ice chill like lace, I might have achieved my goal. I hate ice skating. I, being built not as a pear or even an apple but more like some unnameable fruit that is round in the middle and slender at the bottom and top, have not the ankles to support myself on skates. Standing there laced midway up the calf in figure-skating boots, I wobble, unable to find balance on the thin blades beneath me. The ankle cracking that ensues is enough to cause people to wonder if I’m not slowly crumbling, bones crushed to dust as I teeter and totter. But I grab the wall and ease along, one foot in front of the other attempting to slide. Soon it gets a little easier, and I step away for a moment. The next I’m turning circles on the ice flat on my back. The toe pick having done its job of instantly stalling my forward progress and dropping me to the hard ice below. This is the same the nearly half-dozen times I’ve attempted to ice skate. Somewhere in those years, my wife gave up on me. I would/will never be the strong partner for lifts or catches. Nor will I likely be sailing smoothly, romantically around the rink hand in hand. On Sunday, we attempted to ice skate with our youngest kids. Carson would like to play hockey, and I told him he at least needs to learn how to skate before he tries hockey. Seems logical to me though not to him as he picks out sticks and pucks and padding. I thought maybe Gabrielle could vicariously fulfill that long-ago wish that my wife had to sail through the air over smooth ice and land delicately on a knife’s edge before gliding away, arms outstretched. So in the twilight of an early winter Alaska afternoon, we made our way to the oval at Cuddy Park. 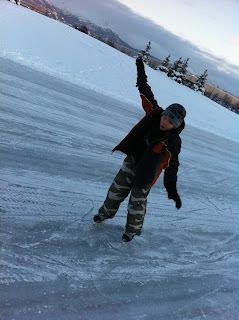 We laced up our battered used newly purchased hockey skates and gingerly stepped onto the snow-dusted ice. I walked Gabrielle around the rink hand in hand while Carson flopped around on the ice in a hybrid of skating and ice running. As the sun sank west of the city and outlined the midtown towers, we increased our confidence away from the mall eyes at the formal rink. Hobbling at first, I stayed near the edge where the invitingly soft snow piled up like safety bales. Then moving out onto the smooth ice, I stretched my legs and put my weight into the blades to glide. Two quick steps and glide, a step and glide. Arms like airplane wings or stabilizers, hips burning from new motions, I made a lap around in what constitutes record time for me. It wasn’t like I ever pictured it, but we made a long, slow lap around the oval hand in little hand in big hand. Gabrielle in between Cheryl and I stepping and skating together, the real wind in our hair and smiles on our faces. Rediscovery and late-attempts at dreams are like the surprise blossoms in early February. They keep you going forward.